November 25th, 2016 By: GGT Category: 2017/03 release, Figure News. 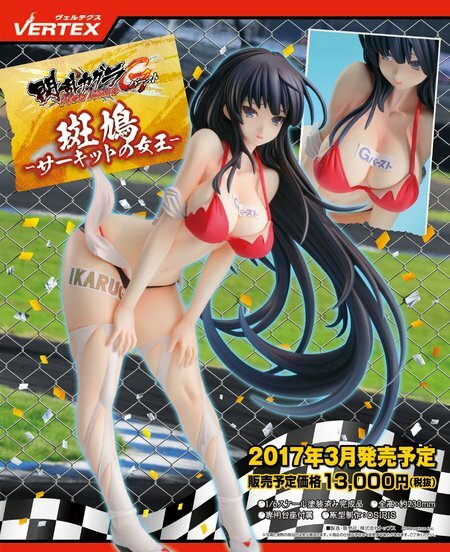 Vertex is going to release the Ikaruga ( 斑鳩 ) -Queen of The Circuit- (-サーキットの女王-) 1/6 PVC figure from the “Senran Kagura” series “Senran Kagura NewWave G Burst” ( 閃乱カグラ NewWave Gバースト ). Will be released in March 2017. Around 230mm tall, 13,000 yen. Castoffable.